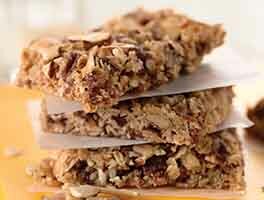 This layered bar is originally from Nanaimo (pronounced nah-NIGH-moe), a city on Vancouver Island in British Columbia. 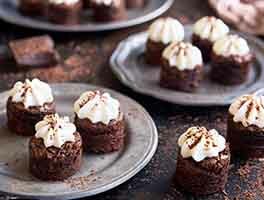 It was born in 1952, when a fund-raising cookbook from the island featured three recipes for chocolate squares. 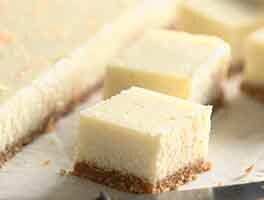 These recipes were reprinted under the name Nanaimo Bars in the Vancouver Sun. Canadian food companies adopted them as a convenient vehicle for their products, and they've been growing in popularity ever since. These bars are exceedingly rich; a little goes a long way. And while the original didn't include coconut flavor in the filling, we think its addition is absolutely perfect. 2 hrs 25 mins. to 2 hrs 30 mins. Preheat the oven to 350°F. Lightly grease a 9" square pan or 11" x 7" pan. To make the crust: Place all of the crust ingredients in a mixing bowl, and beat at medium speed just until thoroughly combined. To make the filling: In a medium-sized mixing bowl, combine the softened butter, 1 cup of the sugar, and the vanilla, beating until smooth. In a small bowl, combine the pastry cream filling mix or instant vanilla pudding mix with the milk, stirring until thick and smooth. To make the icing: Combine the chocolate and cream (or butter) in a saucepan or microwave-safe bowl. Heat until the cream is steaming. Stir until smooth. 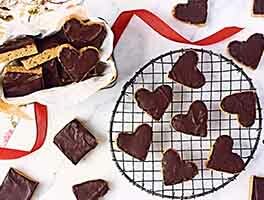 Cut into small squares (about 1 3/4") or rectangles to serve. The bars will be very stiff when cold, but will soften quickly at room temperature. Yield: 48 1" x 2" bars. Store covered, in the refrigerator, for up to 1 week. These bars also freeze well. 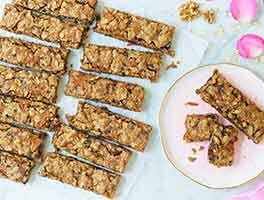 What to do with the instant pudding mix once you've used 2 tablespoons for these bars? Make instant pudding, reducing the milk in the recipe on the box by 3 tablespoons. Add 1 teaspoon vanilla extract for enhanced flavor. For 4 dozen thinner bars, prepare in a 9" x 13" pan. You won't need to amend the baking time, or any of the ingredients or directions. I have no idea what these were supposed to taste like but what I made was delicious. I tried one piece, then another to be sure. To be ABSOLUTELY certain I had a third piece. Definitely will make them again. My only challege was to cut them so that the chocolate top did not crack. I've been making these bars for years. I've always known them as East End bars. A family favorite. Oh wow! These bars are FABULOUS! My family and I absolutely loved them. the only change I made is to use 70% dark chocolate in the topping instead of semisweet; it balanced the sweetness of the filling nicely. I find that there is a very thin layer of filling in the bars; at first, this worried me when I spread it over the base, because I thought it wouldn't lend any flavor to the bars, but that, too, worked perfectly! Some members of my family thought that the crust was too thick a layer, but I disagree! The crust is my favorite part; it is so tasty, even though it's not sweet. I think I would make just the crust someday and eat it as is! 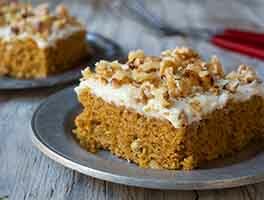 Thanks for this recipe, it is really wonderful and I will definitely be making these again! We just returned from Vancouver Island and ate Nanaimo Bars in Nanaimo, BC. Had to try my own and found this recipe. I did modify it a bit: Crust - used chopped almonds and large flaked unsweetened coconut (Allergies) Used two small eggs and baked a bit longer Filling - Used the Birds Custard ( Yes, it is easy to find.) Doubled the filling (the original amount seemed skimpy) Icing - Used semi-sweet cooking chocolate and 2 tablespoons of butter (No Cream) Found that a heated knife worked wonders to cut these without cracking the icing and limiting the crumbs. I have a gas stove, so heated the knife in the burner flame. These were the hit of our recent camping trip. The entire batch was devoured over the weekend and friends requested the recipe. Thanks for the foundation. It way not be the real deal, but we loved them. looks yummy, and I really want to make them but have a question: what is the pudding mix powder for? Thickening? Could I substitute corn starch? Thanks. Everyone who ate these bars LOVED them. After reviewing recipes on line I realize they probably aren't quite the "real deal", but they are delicious and I am sure they taste so similar to the real deal that it would be difficult to tell the difference, considering ingredients. I think it is much easier to press the bottom layer in the pan and bake it rather than cook it in a double boiler. The only change I would make is -- and I know KAF corrected the amount of cream in the top layer, but -- I used the butter and had to use 3 or 4 tablespoons of butter in order to get the chocolate to a spreadable consistency. Other than that, highly recommended and not too much work for how delicious they are! Very good, sweet and rich. It was my first time making this kind of bar, and it was super easy. The taste is very similar to the ones I bought at Costco in Canada, but without any weird ingredient. I cut the butter in half in the filling and everything worked out fine. The bars were easy to cut and kept their shape like on the picture. These bars have been a Christmas tradition in my family for at least 50 years. The Canadian side of the family was always especially fond of them, which makes a lot of sense. We had no idea where the recipe originated, and we had never seen the exact same recipe published, so thank you! Incidentally, I have recently removed the nuts and coconut (my husband doesn't like them), without substitution, and I always make a double batch of the filling. They turn out perfect (less crumbly than the original recipe, which is a bonus), and everyone loves them. The dark chocolate balances the super-sweet filling perfectly. These bars are fantastic! After I had them assembled, I marbled the top with white chocolate just for fun. When left out at room temperature the next day when I was serving them, they did become soft and a little messy to handle. Still a very delicious recipe.